Every year it happens: summer is over before we’ve even finished inflating our pool floaties. How can school be starting when we still have dozens of items to be completed on our summer “to do” list? Don’t let the appearance of Halloween decorations get you down; there’s still plenty of time to embrace summer’s last gasp. Keep adventuring until it starts snowing with these end-of-summer steals! Our dirt-cheap deals at eBags provide the perfect excuse to indulge in some great travel gear. If you want your summer to go out with a bang, aim for an outdoor adventure spanning multiple days. The more unique this adventure is, the more memorable it will be—so this time, go for unusual accommodations or novel locations, whether it be off the grid stateside, or in a foreign country. Let your accommodations dictate your travel plans! We suggest you check out these awesome tree houses listed on Airbnb or you could also give “glamping” a try—in either case, you’ll get to experience the great outdoors without forgoing a bed or electricity. Find a yurt—a semi-permanent, furnished “tent”—and get packing in the Eagle Creek ORV Trunk. 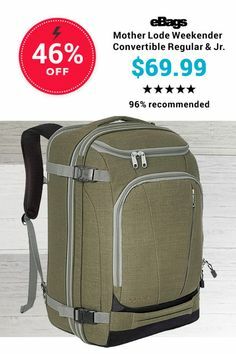 This bag’s wheels allow you to fully take advantage of the fact that you’re not backpacking. Its mobility and size also make it the perfect companion for an international outdoor adventure, which would be an incredibly memorable way to end summer. Hop on a plane to Iceland or Canada for a change of scenery and use the app Hopper to score low airfares! Jump into action with the Red Rock Outdoor Gear Assault Pack. 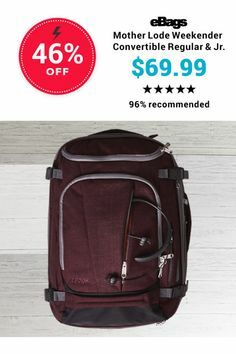 Whether you’re on a day hike or an overnight adventure, this popular backpack is loaded with compartments and pockets for all of your supplies. Every detail adds to your street cred as well as your pack’s functionality. If you’re packing lots of gear, the webbing on the pack’s front and sides allow you to expand your cargo options by attaching extra pouches and accessories. You can’t beat outdoor exercise for the triple-whammy of endorphin rush, Vitamin D, and beautiful scenery. Hiking or trail running allows you to cover lots of ground, as long as you’re equipped with replenishing snacks and gear. The High Sierra Longshot’s sleek design won’t interfere with physical activity, while its zippered pockets allow you to bring plenty of provisions. The best part about this pack is its hands-free hydration system, enabling you to pack two liters of water while on the run. Even if you utilize every single pocket, the bag won’t bounce around on your back due to its tuckaway, adjustable waistband. If you prefer sightseeing on two wheels, a bike bag may be better suited to your needs. Biking is an excellent way to explore a new city, or even to gain a new perspective and discover hidden gems in your hometown. Spare your shoulders from lugging around a backpack all day, and opt for the Detours Interlaken Pannier Set. The Panniers allow you to reach your water bottle when stopped at an intersection, and the zippered front pockets enable easy camera access for an unexpected Kodak moment. Flying over curbs and potholes is no problem since each pannier attaches to a rear bike rack with two fixed, spring-loaded clips and an adjustable bottom hook. The panniers are excellent for any biking scenario, as they are expandable and include rain covers. Seize one of the final opportunities to get away while there’s guaranteed good weather. Even though your travel plans may be spontaneous, the durable Eagle Creek Tarmac Series leaves nothing to chance. Every last detail is engineered with the traveler in mind. 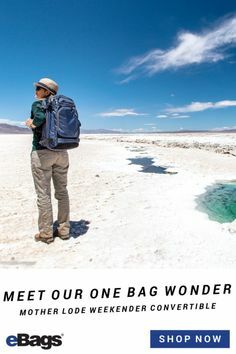 It’s constructed out of Bi-Tech and Bi-Armor fabric for extreme handling and weather resistance, and the expandable main compartment adds 15% more packing space. It boasts details like self-repairing zippers, padded exterior pockets, a detachable cargo net, rugged wheels and a coat-keeping system. All aboard. Start your journey on the right track! Eagle Creek’s quality engineering shines through again in the Eagle Creek Switchback Carry-On. The removable back-to-back straps make this one of the most flexible bags on the market. If you’re navigating cobblestone streets, wear it as a backpack; if you’re catching a train or plane, wheel it along the platform/concourse with ease. 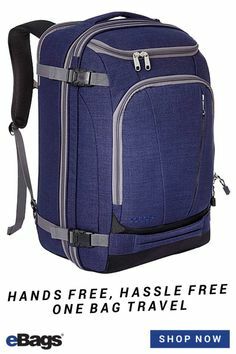 Not only can it transfer from a backpack to a sleek wheeled bag, but Eagle Creek provides you with front koala-carrying clips for close-to-body security. This is the crème de la crème of sleek organization: the EXO 2.0 Hardside Spinner plus eBags packing cubes. The hardside spinner cannot be beaten for weekend trips, as it’s protective, chic and easily maneuverable. 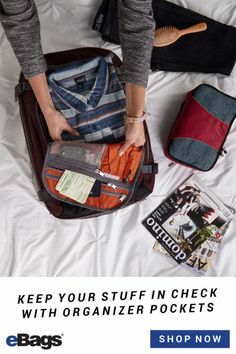 The 100% polycarbonate shell slips easily in and out of luggage racks, while the flush-mounted cross-over zipper locks keep prying fingers out of your goods. 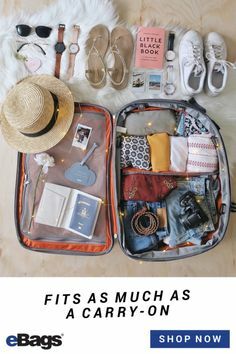 If your spinner gets bumped around while in transit, the eBags Ultralight Packing Cubes will keep everything organized and separated. Packing cubes and spinners = a match made in heaven! Turn heads with this gorgeous Tumi Carry-On. The luggage’s hard sides boast eye-catching, unique designs that are appealing worldwide. Its four spinner wheels, coupled with its three-stage telescoping handle make this magically maneuverable. This Tumi rolls like a dream and its designs will have you on cloud nine. Soak up the final moments of summer the best way we know how: getting out of the house with an arsenal of new gear! These dirt-cheap deals at eBags will help you make Summer 2016 one for the books. Now get out there! Your Gently Loved Bags Get a New Life. You Get 25% Off. WIN-WIN.